The Women's Reserve of the United States Naval Reserve was created by an act of Congress on July 30, 1942. This act was designed to appoint and enlist women as a necessary wartime emergency measure, in order to replace men who could thereby be released for active sea duty in the deployed operational forces and seagoing fleet. 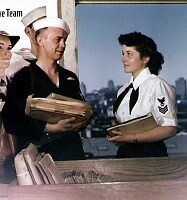 ....... During 1942, the Navy Department was especially pleased that female volunteers enrolled in numbers three times that expected during the legislative debates. This help multiplied the number of shore-based male sailors who could be released for fleet service. 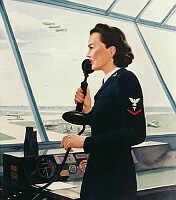 Large numbers of women were first assigned to maintain the Navy communications system. 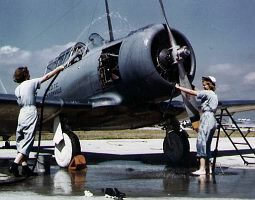 Two WAVES washing a North American SNJ training plane ..... Furthermore, women were being trained for jobs in gunnery and blind flying instruction, aerology, aviation ground crew work, navigation and other fields. The Navy estimated that these women of 1942 freed enough men to outfit an entire task force composed of 1 battleship, 2 large aircraft carriers, 2 heavy cruisers, 4 light cruisers and 15 destroyers. The year 1943 witnessed the placement of needed WAVES into yet more billets once exclusively reserved for men. In November 1943, Congress provided legislation that removed its former limitations placed on female officer ranks. Picking up mail at the Fleet Post Office, San Francisco, California ..... 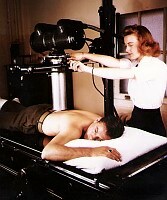 Throughout 1944, the “experiment” of using women proved sound policy for the United States war effort. WAVES responsibilities were again increased. 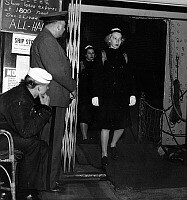 By now, female personnel were posted to district headquarters, navy yards and docks, supply depots, naval air stations, and all naval hospitals. Nearly 80 percent of all administrative work was being done by WAVES, to include supervising and running the entire naval mail service. Furthermore, the vital Washington-based naval communications nerve center was comprised of 75 percent WAVES. Thousands of WAVES were assigned to the Supply Corps, where they expedited wartime supplies to ships and to advanced overseas bases. Women were placed by the Navy in both mundane and dangerous activities. For instance, WAVES operated all the laboratories and many of the firing bays at the crucial Indian Head rocket powder plant, which conducted most testing of American rocket propellants. There they composed nearly half the personnel assigned to this critical facility. ...... As many as a third of all WAVES were assigned to naval aviation. In this field, women fixed aircraft, packed parachutes, provided weather information, served as link trainer instructors, served as gunnery instructors, coordinated air traffic from control towers and a performed host of other aviation-related jobs. In keeping with the racist policy of the US government, the Navy denied black women service in the WAVES during most of the war. However, McAfee, the Women's Advisory Council and black women leaders kept pressure on the Navy Department and continuously demanded that black women be permitted to serve on a fully integrated basis. No action was taken for over two years until First Lady Eleanor Roosevelt, wife of President Franklin D. Roosevelt, joined this effort. Her direct interest forced the Navy to open its WAVES program to qualified Black applicants. Finally, in October 1944, the Navy announced the plan to commission black women (who nevertheless had to possess super-qualified credentials) and to put the first enlisted black women into training by January 1, 1945. 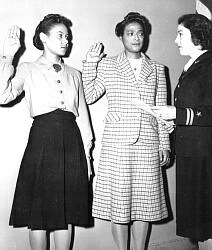 Harriet Ida Pickens and Frances Wills became the Navy's first African-American WAVES officers in December 1944. Seventy-Two black women enlisted and started their training at Hunter College. Their ability set the precedent for later successful integration of black men. First Lady Eleanor Roosevelt was still forced to intervene against the Navy to force fair treatment within the WAVES during the war. For example, her active intervention was required before naval bases allowed Jews and Blacks in the WAVES to use recreational facilities. ... Frances Wills (left) and Harriet Ida Pickens are sworn in as Apprentice Seamen at New York City in November 1944. 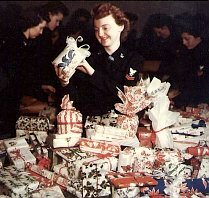 ...... During the final war year of 1945, enlisted women could choose from a total of 38 different ratings in the Navy. Almost every shore establishment had WAVES on active duty fulfilling necessary military work of every kind, from general office workers and supply accounts specialists to film projectionists and drivers to dental prosthetic technicians. Within the Navy Department headquarters at Washington, D.C., over half (55 percent) of all service personnel were WAVES. As another example, 70 percents of the Bureau of Naval Personnel was composed of WAVES. The termination of World War II for the United States was achieved by its triumph over Japan on August 17, 1945. This was also the end of further WAVES procurement, since the military use of women as an “emergency” measure ended with the coming of peace. The ranks rapidly diminished and no new WAVES were accepted. By September of 1946, the majority of WAVES were either discharged or released to inactive duty. .